Shadow Shopper Reviews - Legit or Scam? They also have working relationships with 250+ mystery shopping, merchandising, demonstrating and market research companies in North America and are members of the Market Research Association and World Alliance for Retail Excellence & Standards. Mystery shopping is a great way to participate in market research and earn some extra money. Companies pay mystery shoppers to visit their establishments and interact with their employees, ultimately reporting and evaluating on the entire experience. This arrangement greatly benefits both parties. As a shopper you get paid and rewarded with free food, items, or services. Meanwhile the business owner gets a detailed account of what goes on in their shop while the boss is away. The information that you provide is then used to improve employee practices and finetune the overall shopping experience. Depending on the job you may be asked to report on a variety of aspects such as restroom cleanliness, temperature of the food, timeliness of service, and so on. The types of businesses that you will be asked to frequent vary as well with restaurants, banks, and theaters in the mix. Upon completion of the tasks you will be paid after submitting your reports and/or invoices. Shadow Shopper membership is based on two levels, Gold and Bronze with corresponding levels of amenities. The free membership allows you to apply for job listings posted more than 7 days ago. You also get added to their database for potential employers to contact you directly. You can also apply for Promoted Jobs – ones posted on top of the list due to immediate need of shoppers). The Gold membership costs $6.95 per month and provides you with all of the benefits of the Bronze membership plus access to the most recently posted jobs. You also get first priority listing when employers search Shadow Shopper’s database. If you need assistance you can submit their online contact form and someone will get back to you shortly. They also have a helpful FAQ section and an article explaining how mystery shopping works for your benefit. There are mixed reviews for Shadow Shopper, and they currently have a D rating with the BBB. However in regards to those complaints it is clear that the company has made an effort to resolve the issues with their unsatisfied customers. Some other issues that people have posted about are in regards to the amount of jobs that are available – however keep in mind that there is a difference between the paid and free memberships, so those paying will have a much higher chance of landing a job. Overall mystery shopping can be a fun way to get some extra cash but know that these jobs are in high demand and don’t pay that much. If you do not want to work with Shadow Shopper you can take the time to seek out local market research companies and try to find these opportunities yourself. 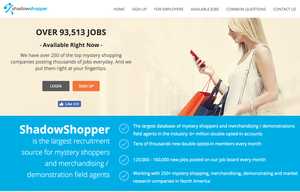 Some other companies that provide listings for mystery shopping include A Closer Look, ShoppingJobs.com, and Jobs2Shop.com. If you have a membership with Shadow Shopper or have previously used them please leave a detailed review below. Average Rating for " Shadow Shopper " is 1.66 out of 5 based on 44 reviews. They r a scum got me to send money to people that didn't existed but i got it back once they sued western union 4 allowing it? Everyone who has been ripped off needs to file a complaint at www.ftc.gov. They will investigate, take the appropriate actions such as the ATT lawsuit, & refund monies as well as make the company STOP illegal practices. Federal Trade Commission. You guys and gals helped me make my mind upin a hurry. At least I was able to learn from your experience... rather than having to learn the hard way. Thanks for sharing. When I told ShadowShopper that I was interested, I received several e-mails about shops in my area. But then I did investigating and learned that you have to pay them. NEVER pay companies to be a mystery shopper. After I told ShadowShopper to remove me from their e-mail list, I received a lot of scam calls from several different phone numbers. Looks like someone sold my phone number. I created a Bronze Membership with Shadow SHOPPER and have not UpGraded my account with them. In the past year,because I have this account, other companies looking for Secret Shoppers emailed me with job opportunities. I have done secret shops for Carl's Jr., Banks& am responding to a new email in the morning. Sorry to hear others have had bad experiences. Maybe try just setting up a Bronze account as I did. I'm going to upgrade myself. They offer you a free gold membership that does absolutely nothing and once its up they charge you $29.95 and there are NO REFUNDS. because that is there policy, of course it is its a scam! If you call to cancel there is no phone support and it is difficult to do online. Do not take this free offer! Save yourself $29.95. I did not even know what shaddowshopper was. I am a senior, I did not sign up initially. Somehow they have been charging my card since 2013 with upgrades, etc. How could I respond to a no refund policy if I never saw it, knew about it, or signed up for it. This is either a mistaken identity, fraud or even a scam. Yes, I will report this to the better business burueau because this is approx. 30 a month for 2 years fees. My mistake in not checking my act and taking it for granted my automatic charges. My bad. But this is not a good way to handle clients. No refund for something they know nothing about. I am REALLY UPSET AND WILL FOLLOW THROUGH ON THIS. Contact Consumer Affairs in your state about them. I had a similar problem with NetZero and Consumer Affairs fixed it for me. Somehow they obtained my bank info and charged my account? I did I job for Stanton optical. I kept getting a run around and never have received the pay a promised. and to the Db New yor person I would suggest that you were paid to say they were good no one else has. I think we have enough info to go to the Attorney Generals office and file to put them out of business. Anyone know how I can get my money?